Ambassador (Dr.) Robin Renee Sanders book "The Legendary Uli Women of Nigeria," was launched December 6, 2014 in the country that inspired its writing -- Nigeria, with support by Nigerian captains of industry and the media, non-governmental leaders, and recognized Nigerian academics leading the way in noting the ground breaking message of the book -- African sign and symbol systems such as Uli, although artistic, are important, social, and political information systems about the culture they represent. The well-attended book launch provided an opportunity to raise the profile of this critical issue for Africa and the world to see sign and symbol systems differently and as viable information systems (click here to see Channel TV's clip of Uli Book launch (https://www.youtube.com/watch?v=gX6lX0PL874). Using Uli as a case study in her Robert Morris University (RMU) doctoral dissertation which won an award from the University's Department of Communication and Information System for its uniqueness, the book hails from her field research about the issue of these very fragile information systems which Sanders calls "communication expressions," which are disappearing or endangered around the world. There are a number of them in Nigeria, with Uli being near the top of the list of disappearing completely, particularly the meanings of the motifs. Dr. Sanders spent time also learning how to draw each of the motifs herself and her drawings and other graphics are included in the book along with some 116 color photographs which the Ambassador took of the Uli women she met and her travels to the region. In line with the tradition in Nigeria of a leading academic reviewing the book, Dr Chuu Krydz Ikwuemesi, who worked with the Ambassador over the years in supporting income-generating projects for Uli practitioners, and who is a leading Nigerian scholar, provided his professional academic comments about the role the book is playing and will play as regards to endangered sign and symbol systems such as Uli (click here for Dr. Ikwuemesi's book review: (http://bit.ly/Ikwuemesi). In addition leading Nigerian media outlets such as Channels TV Chairman John Momoh moderated a "conversation," segment with Dr. Sanders during the launch on the book, current US-Nigeria relations, and next steps following the US-Africa Summit. Nigeria's leading newspaper, The Guardian, also covered the event (photo above), and Sanders appeared the next morning on the Channels TV's main news magazine show, Sunrise Today (see this link for Channels TV Sunrise Show, which most focused on the current tension in the US-Nigeria relationship (Sanders' clip begins at minute 7:53 - https://www.youtube.com/watch?v=O32vXzaFCx8). Other notable and honored guest speakers at the event included, Estisalat Chairman Hakeem Belo-Oasgie, former Group Managing Director of Diamond Bank, Dr. Alex Otti, and one of Nigeria's leading women on SME, Entrepreneurship, and Development issues, Ms. Evelyn Oputu. 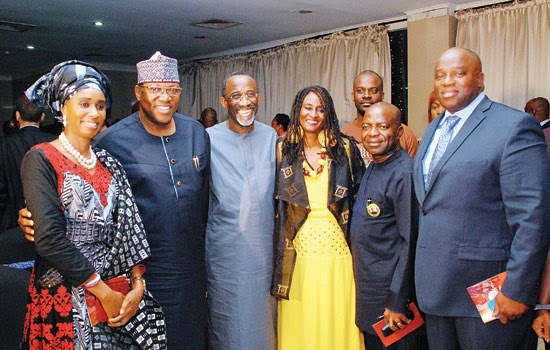 Key Guests such as George Ebuh of Petrolog, General Dambazu, Toke Ibru of The Guardian Newspaper, Terra Kulture Director Bola Austen-Peters, Arik Airways Chris Ndule and Nigeria's leading and icon artists Bruce Onoprakpeya and Chief Nike Okundaye were also present. A portion of the book sales will go to the Nigerian organization the Art Republic, which assists with income-generating project training for Uli practitioners under the direction of Dr. Ikwuemesi. I met our distinguished author, painter and sculptor Ambassador Robin Rene Sanders at the threshold of her interest in Uli in 2008. Her hard work and unflagging interest over the last few years have crystallized into the book that we are gathered to celebrate today. The book is the story of the ripples of a vanishing heritage; it is the story of some vernacular classicists, vanguards of the disappearing Uli art of the Igbo. What is Uli? It is the Igbo name for the indigo dye obtained from several species of plants. Usually, the berries of these plants are extracted and ground and the dye is pressed out of the marsh with the fingers and used as a medium for drawing on the human body with the help of the Uli knife (mma nw’Uli). Uli is also the name for the traditional Igbo mural, although the indigo dye does not form part of the palette in such painting. Both the body and wall variants are essentially a female tradition. The Uli artists were highly respected group of women in Igbo society. The Uli art was usually passed down from one generation to another. This helped to ensure continuity. Many scholars and artists have studied the Uli art phenomenon from various perspectives at different times. It would appear then that Sanders’ book does not deal with a novel subject. However, her book, written in simple accessible prose, is anchored on fresh perspectives that bring issues to a new frontier. Beyond the long-standing studies of Uli as cosmetic art among the Igbo by many scholars since colonial times, Sanders affirms Uli’s other little acknowledged essence as an idiolect. The centralizing thesis of Sanders’ book is that Uli has extra-aesthetic and phenomenological qualities that inscribe it as a “communication expression”. In other words, beyond embodying beauty as framed in Igbo thought, art, and aesthetics, Uli captures and communicates in graphic terms the “lifeworld”, collective experience and philosophy, not just of “traditional Igbo women”, but of the Igbo society as a whole. Focusing on the lives and works of selected Uli women painters from Agulu, Inyi, Ogidi and Nri, Sanders book at once underscores Uli’s endangerment and its potential for new experiments as a creative idiom. Carefully calibrated into sections and further enriched with clear images of relevant people, works and activities, The Legendary Uli Women of Nigeria appeals to readers of all background, although its place as a scholarly work in the history and development of Uli art cannot be denied. Unlike most researchers who have written about the Uli women classicists, Sanders, it must be noted, has practically supported efforts geared towards empowering these women economically through organized Uli retraining workshops that also aim to preserve the Uli heritage and Igbo culture. In a place where heroic materialism, westernization and the attendant nihilism have taken a heavy toll, Sanders’ book does one unique and significant thing. In the style of the mythical Sankofa, it looks backwards while moving forwards and it says one thing to us: Forward to the past; but not in a sense that celebrates underdevelopment and glorifies stagnation. It only reminds us to be mindful of ancient landmarks as our chariot of development hurtles across the forest path of modernity on its fateful journey nowhere. It tells us that much as the destination remains alluring, we must arm ourselves with memory (the past) to be able to encounter desire (the future) without losing our essence and identity as a people.